When we were little and it was our birthday, our mum would draw up a Breakfast In Bed menu, with everything she could possibly think of, and bring it into our bedroom with a pen. You’d mark off what you wanted for breakfast, and she’d disappear into the kitchen for a bit. Then your chosen breakfast would be presented to you on a tray, with a flower in a vase. It was awesome and we loved it. This was such a good idea that I stole it for a present for my niece. 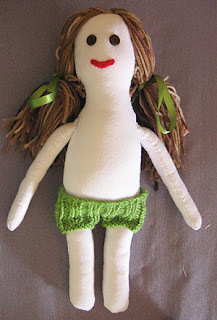 So I present to you a simple gift idea for kids – DIY (Design It Yourself) Doll gift. I wanted to make a portrait doll of her, but you can make a normal doll instead if you prefer. You can decorate the menu any way you like. Step two: Give the menu to the child and help them fill it in. 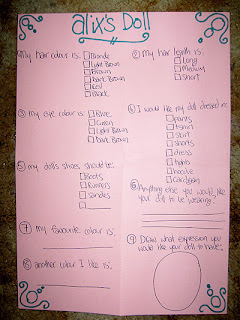 Step three: create a doll based on the answers given. There are any number of free doll patterns on the net for you to find, so I wont give another one here. Step four: Give the DIY doll to the child. Done! Below is the doll I made for my niece. 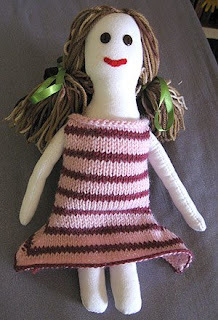 She likes pink and green as colours, and specified that she would also like her doll wearing ribbons. Next post: Such a crafty sunday!